Mr. ThreeYear and I visited during our Asia trip last year, and we loved this clean, modern city-state. It’s a global financial center in Southeast Asia, very expensive to live in, but modern, efficient, and crime-free. Seriously. I could leave my purse sitting on the table in a crowded Hacker Center (an informal outdoor pavilion of lunch counters) and no one would touch it. It was actually weird. Mr. ThreeYear’s company has offices in Singapore, so while we were there we visited those offices and met with some of his Singaporean colleagues. Actually, only one of his colleagues is a native Singaporean, a native Chinese (apparently, according to my friend, the Chinese, especially Chinese Christians, are some of the most powerful members of society in Singapore). The other colleagues are ex-pats who’ve made Singapore home. It seems they generally like living here, because the climate is so nice. 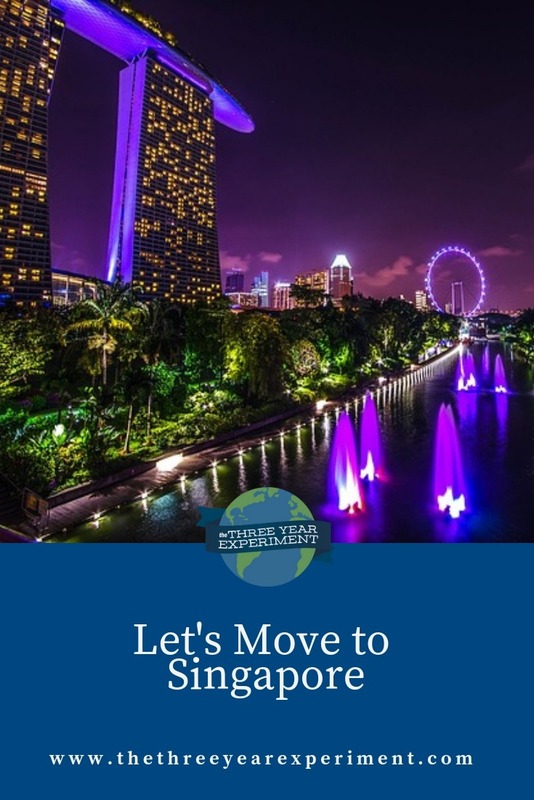 Singapore is just above the equator, so the climate is tropical—warm and humid when we visited in February. Temperatures range from mid-70s to mid-90s all year long. Our friends lived in an apartment complex with an incredible pool structure—several interconnected pools that they swim in practically every day. The kids played in the pool area, or on the playground structure, all while their nannies watched from nearby. Even though Singapore is a first-world economy, services like domestic help are still very inexpensive. 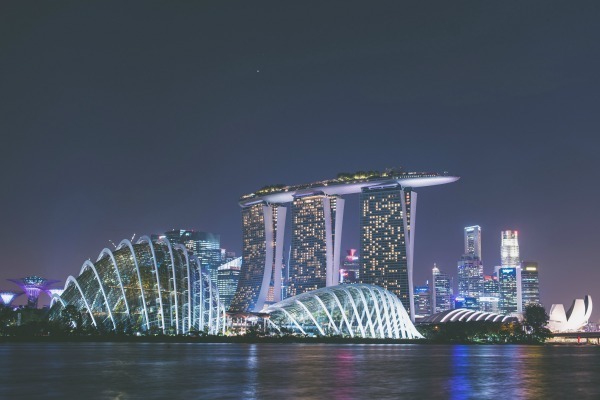 There are many immigrants from countries like the Philippines who move to Singapore as live in housekeepers and nannies, and send money back to their families. So it is pretty common for middle class families to have a live-in “helper” as they’re euphemistically called. 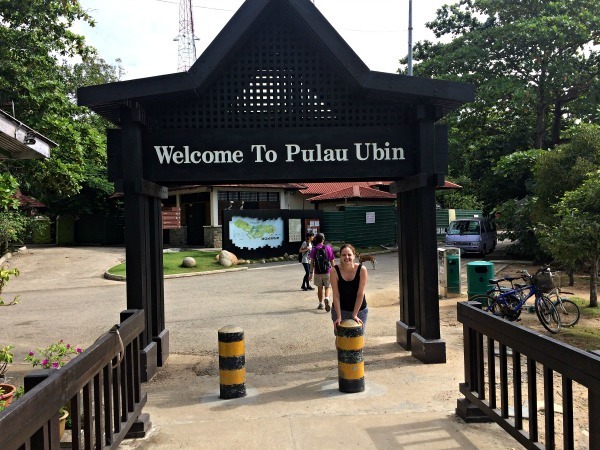 One of the things we did on our trip was visit Pulau Ubin, the only small island in Singapore that has been left as the country was in the 1960s, before Independence. This was the only pre-1965 community that was kept intact, and not modernized. It acts as a museum for the way things were. We headed over to Changi Point Ferry Terminal, and took a ferry over to the island (it was really cheap, about $3 Singaporean dollars, or about $2US). Then, when we got to the island, we rented bikes, as they’re the only transportation allowed. 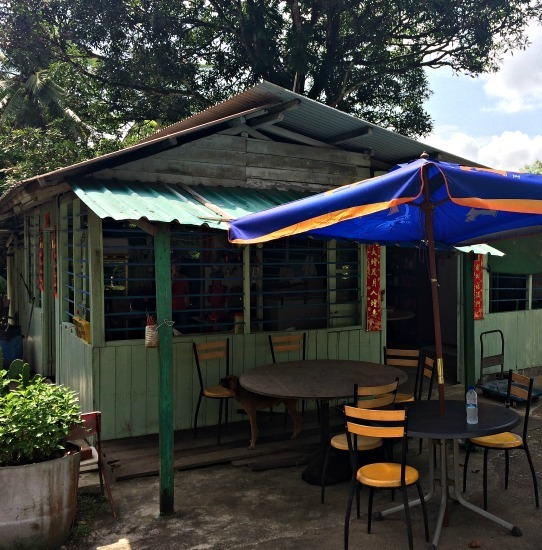 We rode past traditional Singaporean houses, squat concrete-block, tin-roof structures, constructed piece-meal, with chicken-wire fences and homemade gates. They were awesome! That’s the thing about Singapore. After a while, all the modern construction and high rise buildings look a little too perfect, and it’s refreshing to see some imperfect, real buildings. The island is supposed to serve as a reminder to Singaporeans that they’re only 52 years removed from this type of living, but for us, it was just a refreshing glimpse into the underpinnings of this area. For lunch we ate in the afore-mentioned Hawker Center. 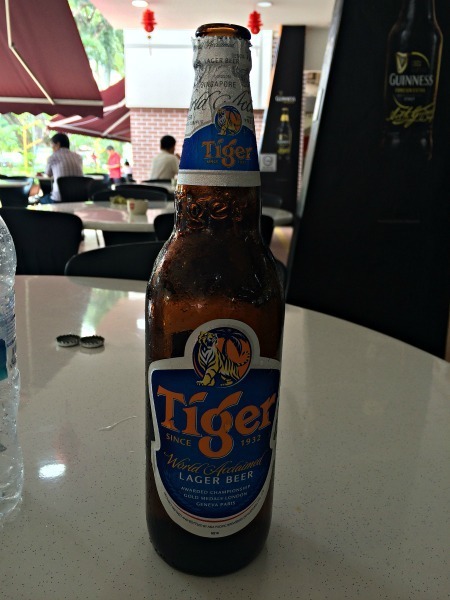 We had the recommended Chinese noodles, sweet and sour chicken, and 2 huge bottles of Tiger beer (which promptly sent us back to the apartment for a nap). The food in Singapore is so good. Because there are so many cultures that coexist in one small area, you can get food from all areas of Asia, pretty much anywhere. On Saturday, we went to an upscale Indian restaurant. Each of us had trays with large banana leaves cut into rectangles to fit the lacquered black trays. 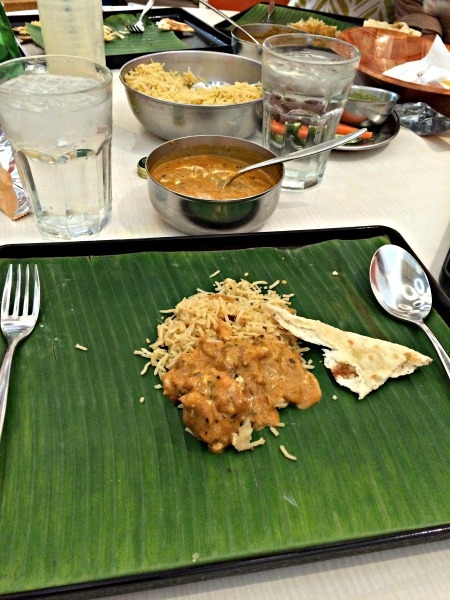 When the food arrived, we all shared rice and main dishes, and mixes them right on our leaves. We used naan to scoop everything up. As someone who’s never been to India, this was totally fun and new. One of the best things we did cost money—mega money. We booked one night at the Marina Bay Sands, Singapore’s iconic boat-shaped hotel with an infinity pool on the 53rd floor that’s famous for the view. We actually stayed in this hotel! In the end, we spent more money on that one night than we’ve ever spent on a hotel before—something like $500US! Would I do it again? Yes, I would. It was such a cool experience. You got to see the entire city—the view from our room was just incredible. Plus the hotel has a huge mall, casino, and restaurants attached, so there was so much to see and do in our short night’s stay. I wish I had known beforehand that our friends couldn’t come with us to the pool. 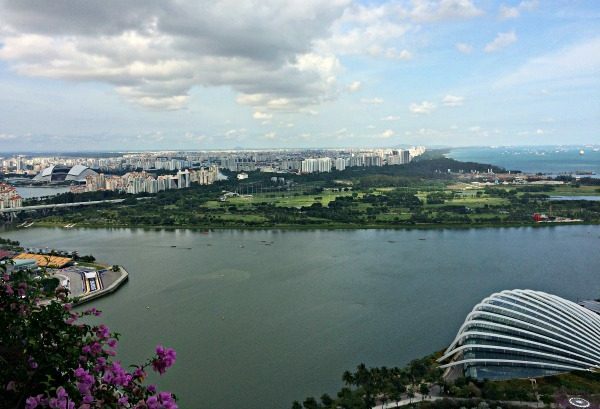 Instead, we had to part ways and couldn’t share the best experience we had in Singapore. While it was expensive, we stayed with our friends for the other two nights we were in town, saving tons of money that way, so it didn’t break our budget. The view from the Infinity Pool at MBS. So, one little fun fact about Singapore: the cars are ridiculously expensive. They tax cars so heavily on the island that my friends, who drove a Toyota Corolla, paid around $1500 a month to rent it (I don’t remember if that is Singaporean or US dollars. But still!). People pay so much on cars, something like $100,000-$150,000, that they’re only allowed to have for ten years, that most people say, oh what the heck, and pay an additional $30-$50K more for a BMW, Mercedes, etc. Singapore seems to have lots of English teacher opportunities. For accredited teachers like me, the Singapore American School looks like a good option. It’s quite a prestigious school and lists these stats: 375 faculty, 73% of which hold a Masters or Doctorate. 7.3 years is the average tenure. The school has been around since 1956, even before Singapore became a nation, and would undoubtedly have some of the best and brightest students in the nation. Currently, there are only two jobs listed for the upcoming school year. It looks like it might be difficult to get a job there. It also looks like it might be a boon—the school even offers a Masters and Doctorate program through Buffalo and SoCal Universities in the States. Jon at Jon Is Travelling shares that he made $3500US teaching English without a teaching degree. He details how he managed to live very nicely on that, by finding a low-priced room to rent. As a single person you definitely have more options! The thing that would be very appealing about living in Singapore is the culture. My kids would learn about Chinese culture, Southeast Asian culture, and Indian culture, on one island! Plus, Singapore has so many other cultures living there are immigrants as well. 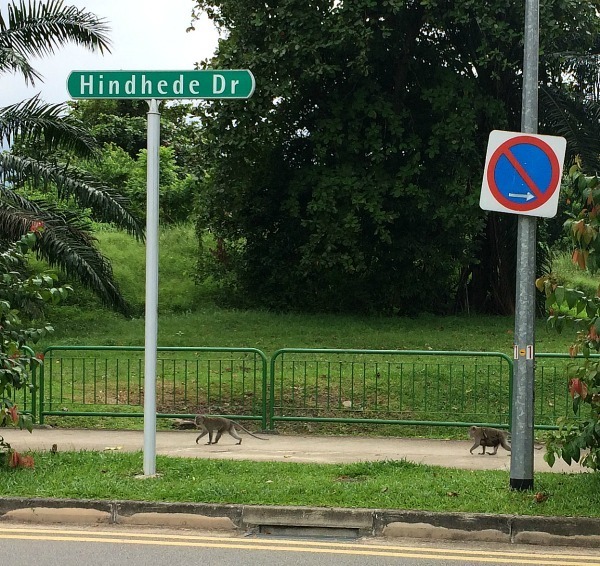 Singapore’s famous monkeys. The second one is carrying her baby underneath her. It’s also extremely close to amazing destinations all over Southeast Asia—three hours by plane from Bangkok, three hours to Bali, six or so hours to Australia, three hours to India, six hours to China… Apparently, many, many people spend as much time as they can in Bali, because it is so cheap compared to Singapore, and, of course, it’s Bali. They can fly over cheaply to Indonesia (I think our connecting flight was around $200 in a touristy season), stay in a beautiful resort, and eat very cheaply, then fly home in three hours. My friends joked they could tell how long someone had lived in Singapore by where they were currently flying to vacation. One more view from the pool! Honestly, the cost of living in Singapore scares me. 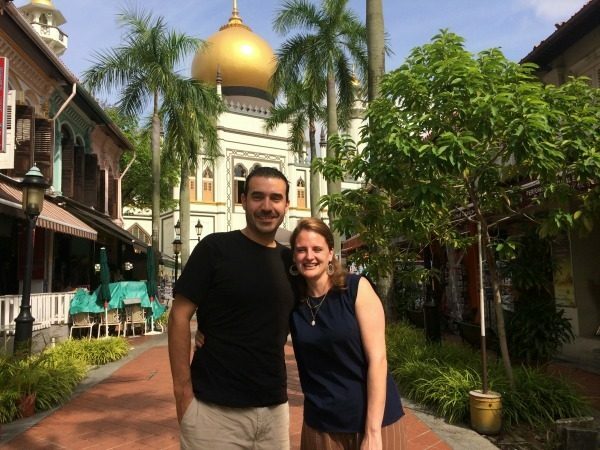 It was by far the most expensive place we visited in Southeast Asia, and to live there would be a bit like putting the golden handcuffs back on! But, part of me is tempted, because what an amazing experience it would be for our family, to grow up in such a vibrant and rich society. It’s also probable Mr. ThreeYear could stay with his current company if we moved there, and he loves his employer.